YOBs grew out of the annual get together of the older players which Tony Brown organised back in the 90s. Richard Cockcroft, Mike Brain, Colin Ellis, Alan Grant, Brian King, Jim Everett, and John Mulholland are those who used to regularly attend. Back in the days of grass pitches Saturdays were a much more social occasion as there were always several teams in the Clubhouse at the same time coupled with the pouring of several libations (watering cans often replacing more conventional jugs). Tony cannot remember exactly when the YOBs took on its present form but it would have been around the time Tony stopped playing so approximately 2012. They decided that a regular lunch time was the most convenient way for all of us since all except John Mulholland had stopped doing any form of paid work. They decided that they needed a pub with good beer and the ability to serve wholesome food. After trying out a range of hostelries they settled on the Coach and Horses at Rotherwick and have now been there for some time. It being a proper country pub - no pretensions just plain and simple but good. Dave Chatfield volunteered to be the Hon Sec. A post he held until recently when his affliction became such that he did not feel content to continue. He continues to attend regularly and as always maintains a keen interest in the Club. The YOBs meet on the last Friday of each month. This remains constant to ensure that no one can be ignorant of future dates for diary planning. It is also helpful for older persons whose memories are not what they once were! The Chairman and President have a standing invitation even though they are still young. Discussions centre on the Club but range over any topic of interest to such a gathering. They issue attendance notes together with a summary of items of interest discussed. Members who reach their 80th birthdays are presented with a suitably engraved tankard to mark the occasion. Jim Everett received his in 2017, Tom Stimson in February 2019 and Richard Cockroft will be presented with his at the March meeting. We all enjoy each other’s company and will keep going as long as we are able. 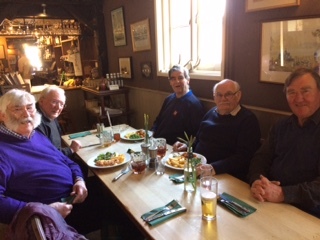 They continue to seek out members who are not seen around the Club these days - a few months ago Robert Duffy brought along Gordon Pitt who was a member of the very first YHC team.